and by descent until 2017. Ruiz Vernacci Archive, no. VN-07319. Gobbierno de Espana, Secretaria de Estado de Cultura, Fototeca del Patrimonio Historico, photographed between 1879 – 1896 by J. Laurent y Cia. The present portrait, datable by costume and hairstyle to circa 1603 – 1604, is therefore most likely to have been painted while Pourbus was on a mission in Innsbruck or Graz, home to the Leopoldine line of the Hapsburgs. As such, it may form part of the series of portraits Pourbus painted there of Archduchess Constance, Queen of Poland, Archduchess Eleanor of Austria, and Maria Magdalena of Austria. The artist’s contact with possible models was direct: Gonzaga had sent Pourbus to the Tyrol to paint a portrait of his niece, Archduchess Anna, (youngest daughter of Ferdinand II), who happened at that time to be a candidate for future wife to Emperor Rudolf II. From Pourbus, the duke demanded ‘paintings of all the most beautiful women in the world, both Princesses and commoners… the most famed beauties of this Realm, both living and dead, both Princesses and those of lesser condition’. It is, however, impossible to identify any portraits that Pourbus painted for Gonzaga’s gallery of beauties. No portrait attributable to Frans Pourbus the Younger that we know of can be clearly related to this Mantuan commission. Nonetheless, Ducos observes it would be surprising not to have found any example of the Spanish monarchy and its branches among them. 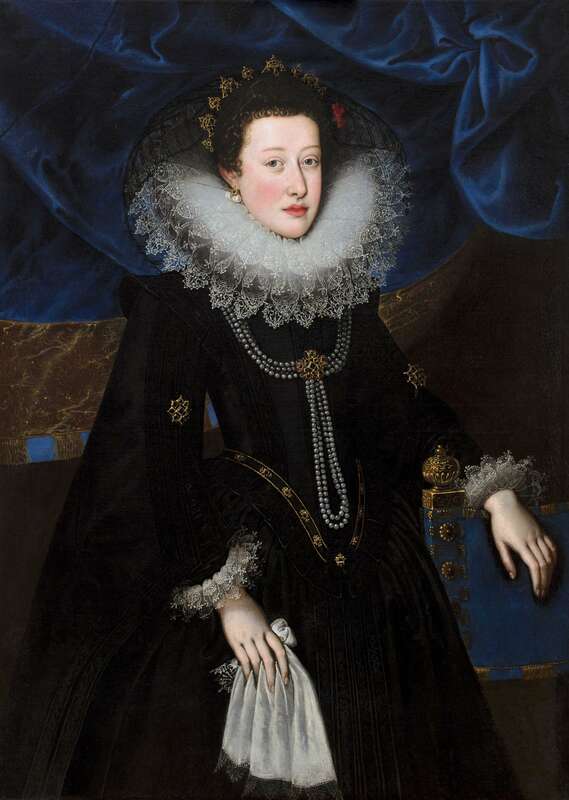 The present sitter, with her dark hair and eyes, and rich black dress, a fashion specific to the Spanish court, could surely be just such an example. The painting’s long provenance within a noble Spanish family gives further strength to the likelihood of her probable Spanish origin. Rafaella Morselli on the basis of photographs supports this hypothesis: ‘The fact that she wears black points to the Hapsburgs – to Spanish court dress, but also to Innsbruck’. Furthermore, ‘the lapis lazuli blue curtain proves that it is a particularly expensive and important portrait.’ Indeed, the extraordinary blue curtain seen here is unique in the work of Pourbus. The expense of such a pigment, and the choice of colour would presumably have been a collaborative decision between the sitter (or whoever commissioned the work), and the artist. Morselli also suggests the portrait is likely to celebrate an engagement, given the carnation in the noblewoman’s hair. Carnations specifically were used in engagement and marriage portraits of the time. Furthermore, we are grateful to Geoffrey Munn for pointing out the ‘love knot’ jewel associated with betrothal, pinned at her chest. The golden knot is enameled with blue (for ‘purity’) and red (for ‘love’), and is studded with large table-cut diamonds (likewise associated with betrothal). Inevitably, the plan for a Mantuan gallery of beauties was influenced by what Pourbus had seen at Schloss Ambras in Innsbruck. Likewise, he would have been aware of the famous portrait gallery at the Pardo Palace outside Madrid, which included a significant number of female portraits by the likes of Titian, Antonis Mor, Sánchez Coello, Jan Vermeyen, Lucas de Heere and possibly Arcimboldo. These would all have informed his contribution to the duke’s own array of ‘beauties’. Over the years this practice, refined in Mantua, became the basis for his price list. By 1611, if the artist painted the dress himself the portrait cost 100 scudi, while if the clothes were painted by his assistant the price came down to 50 scudi but with the figure designed by him and the head and hands done by him personally. This was a considerable price for that period, which only in the following decade would become the international standard for painters of the first rank. Rafaella Morselli, ‘1600 – 1608, The Court of Vincenzo Gonzaga’, From Merchants to Monarchs: Frans Pourbus the Younger, The Weiss Gallery, London, 2015, pp. 36 – 37. Ambras had been renovated by Archduke Ferdinand II of Austria (1529 – 1595) with monumental frescoes – grisailles in the Germanic tradition, composed of full-length female figures each occupying an independent niche ­– alternating allegories of the virtues, biblical heroines, muses and goddesses of antique mythology. These must have impressed Pourbus, acquainting him with a type of representation in which the female figures – in a serial arrangement – play a crucial role. Returning from Austria, Pourbus would have brought back with him a clearer idea of what a gallery of beauties might look like. (Ref. B. Ducos, Frans Pourbus le Jeune 1569 – 1622, 2011, p. 57). Ref. from B. Ducos, ibid., p. 57. Ref. from B. Ducos, ibid., p. 68. In an email to M. Weiss, 27 November 2017. A. Luzio, La galleria dei Gonzaga venduta all’Inghilterra nel 1627-28. Documenti degli Archivi di Mantova e Londra raccolti e illustrate da Alessandro Luzio, (Bardi, Rome 1913), p. 276. Rafaella Morselli, 1600 – 1608, The Court of Vincenzo Gonzaga’, ibid., pp 37 – 38. U. Rossi, Francesco Pourbus il giovane a Parigi, in Archivo storico dell’arte, 17, 1889, pp. 404 – 408.